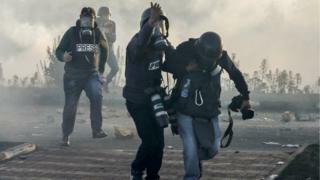 More than 2,500 journalists have been killed since 1990, and media rights groups warn, on World Press Freedom Day on 3 May, of a growing trend of journalists being targeted for the work they do. Monday was one of the most deadly days for journalists, with 10 media professionals killed in two separate incidents in Afghanistan. After a suicide bombing in Kabul, journalists gathered at the scene to report on the aftermath. 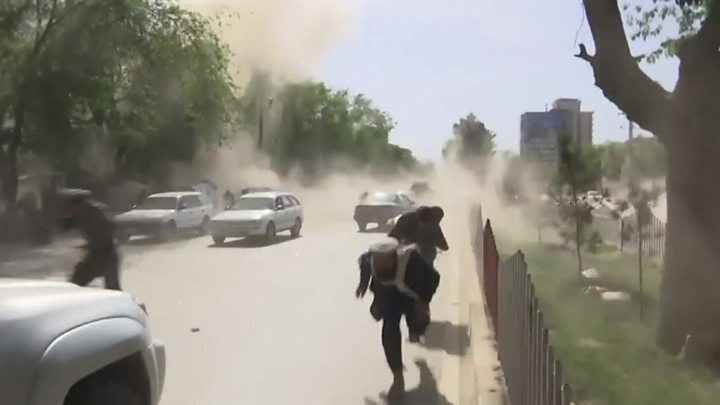 Within 15 minutes, a second suicide bomber, disguised as a journalist, arrived to target them. The Islamic State group (IS) said it carried out the twin bombings that left nine journalists and photographers dead, with many more seriously injured. In a separate attack in the Khost region, BBC reporter Ahmad Shah was murdered later the same day. Two unidentified gunmen on a motorbike shot the 29-year-old as he cycled home in an area that was familiar to him. These recent incidents bring the total number of journalist deaths in 2018 to 32, according to the International Federation of Journalists (IFJ). That’s over a third more deaths than between 1 January and 1 May last year, according to IFJ statistics. So, if the latest attacks are anything to go by, is being a journalist becoming more dangerous? Media rights organisations have been tracking the number of journalists killed, detained and missing since the 1990s. Their data also includes media workers, such as fixers, interpreters and drivers, and distinguishes between those killed in crossfire, in a targeted attack, and while on a dangerous assignment. In 2017, there were 82 deaths – the lowest death tally in a decade – according to IFJ. The number of deaths each year has generally increased since the 1990s and early 2000s, when the total each year did not go above 100. Fluctuations in the data reflect the conflicts of the time, analysts say. Numbers shot up in the early to mid-90s, when there were civil wars in Algeria, the former Yugoslavia and Rwanda. A steady increase then began with the Iraq war in 2003, with the largest number of 155 deaths in 2006, followed by 135 deaths in 2007. Analysts say last year’s lower figure isn’t necessarily cause for relief, as there has been a shift in the reasons why journalists have died. High profile kidnappings and beheadings of foreign journalists in 2012 onwards sparked a shift in news organisations’ policy, with fewer correspondents being sent into danger zones. Mahoney says that because of this, local journalists and media staff continue to “bear the brunt of the deaths”. Most of those killed in 2017 were murdered for their investigations into political corruption and organised crime, according to several media rights groups. Mahoney points the finger at countries such as the Philippines, Russia, and Mexico – which was the deadliest country not at war for journalists last year. Ernest Sagaga, IFJ’s head of human rights and safety, says that while the goals of armed groups in Afghanistan and in Mexico may be different, they employ the same strategy to attack and suppress journalists. Recent cases like the killing of Western journalists investigating corruption in Malta and Slovakia has garnered attention but Mahoney says this is only part of a bigger picture. The number of journalists killed can be a strong statistic to measure the dangers facing media professionals when reporting, but it is not the only threat they face. The year 2017 also marked the highest number of imprisonments – 262 – in almost three decades, according to CPJ. The media rights organisation’s data tracks the number of journalists in jail on 1 December every year, so true numbers may be higher as the annual statistics do not account for those imprisoned and released at any other time. Countries with the highest numbers of journalists imprisoned for doing their jobs are: Turkey with 73 journalists, China with 41 and Egypt with 20. Paris Riots – who are the 'Yellow Vests' and what do the gilets jaunes protesters want from Macron?